If you read the comments attached to Mensflair articles, you may be familiar with Deborah Carré. In partnership with James Ducker they form Carréducker bespoke shoes, and not too long ago I had the pleasure of interviewing them (actually it was a disgracefully long time ago, I’m very slow transcribing). If I can condense the interview down to my word limit you’ll read about it next week, alternatively in full on BespokeMe. I always enjoy picking up snippets of information, not necessarily for any reason other than to expand one’s general knowledge. I learnt one or two interesting things from meeting Deborah and James and thought to pass them on. Some of this may seem old hat to shoe aficionados, but everybody has to learn something for the first time somewhere –and here is as good a place as any. The first thing to note is that the proper name for a shoemaker is a cordwainer. A cobbler is merely a man who resoles shoes, or repairs them. Something else I didn’t realise is that within bespoke shoe making there are at least three different crafts, and each has their own artisan. –Fitters take the measurements and make the lasts. The last is an exact wooden model of your foot. Upon this the shoe will be built. –Closers make the patterns and make the upper. They really earn their money if you go for a Whole Cut, which must be made form a single piece of unblemished leather. 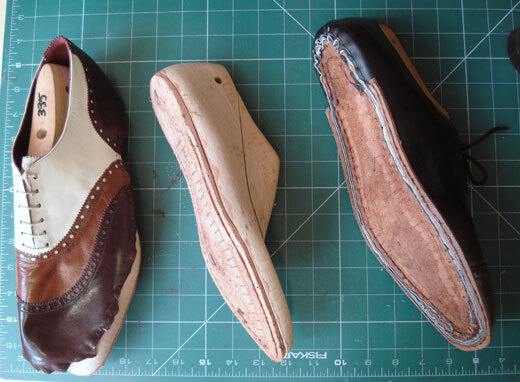 –Makers get the last and the upper, and then make all the rough stuff including the insole, sole, heels and actually stitch the shoes together. If you do the traditional method of entry into the business -a traditional apprenticeship- then you’ll learn one of these three trades. While the larger bespoke retailers will have all three within their employ, small independent shoemakers, will likely seek out the individuals to make the last and cut the leather, just as is the case of Carréducker. I consider it a good day, when I learn something new. It is a common misapprehension to think that a bespoke last is simply a copy of the actual foot (just like a plaster cast). – It is not. Although a bespoke last is based on the actual measurements, in certain parts (heel and instep) the last will be smaller than the actual foot to provide a firm grip. In other sections, mainly before and above the toes, the last will have to supply additional room. It is the skill of an experienced last maker to know where, when and how much to go under or to go over the actual measurements. Different feet (fleshy or bony) and different customers need differing degrees of tightness versus looseness. In this respect, the making of a last is similar to the making of a corset. A corset maker will have to know where to be tight and where to be loose, where to push-up and where to press-down.